We are Hiring a Staff Attorney! 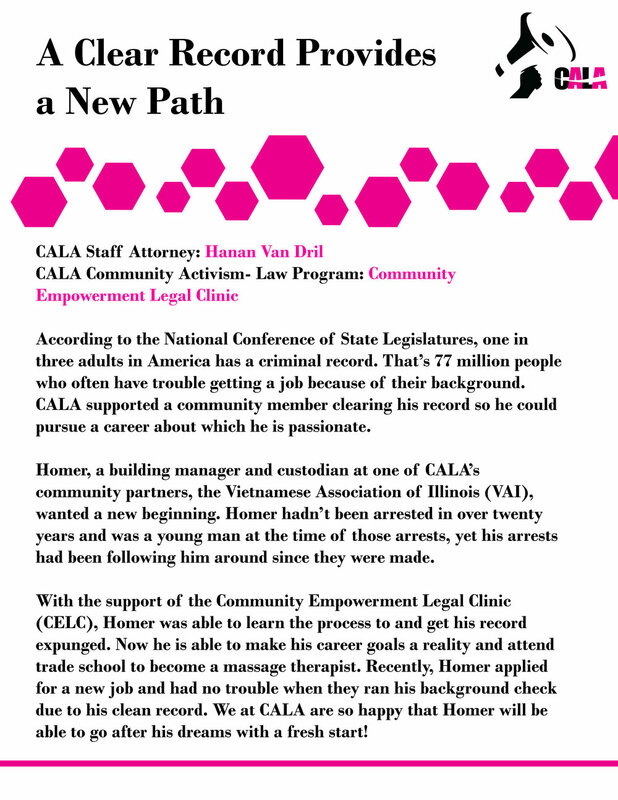 CALA seeks to change legal aid by using its model, "community activism lawyering," to unite lawyers and activists to collaboratively empower underserved communities access justice and pursue social change. Through these partnerships, CALA creates “community activism-law programs” within, co-operated, and directed by our partner communities. CALA accomplishes its two principal objectives at once: provide cost-effective legal services to underserved individual community members and help our activist partners achieve broader social change. 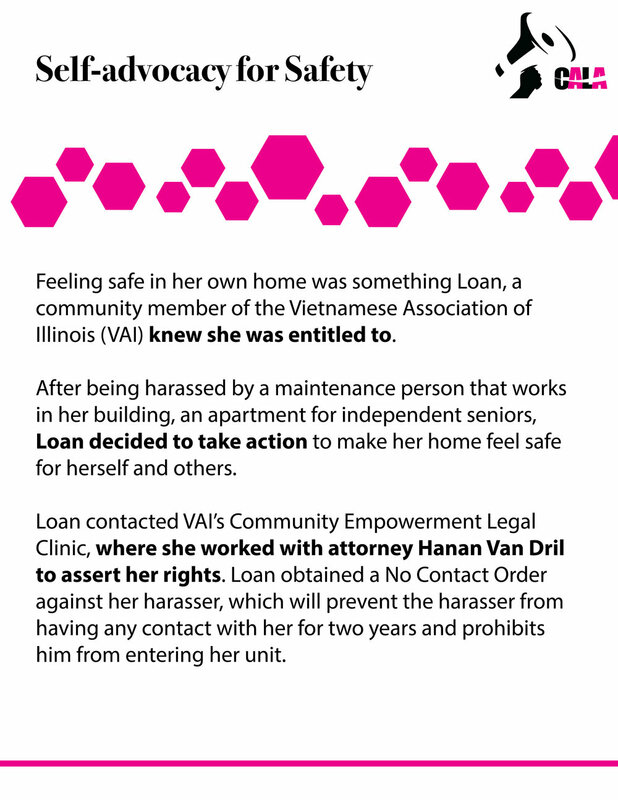 More info about CALA’s model can be found here: https://www.forbes.com/sites/ashoka/2018/10/29/lawyers-forget-the-client-welcome-the-community-how-chicago-is-working-for-justice-for-all/#24d42c8573ad. CALA is looking for a staff attorney with genuine interest in community lawyering, connecting the law with grassroots activism, and being part of a new legal services model. The attorney will have three primary responsibilities: 1) handle litigation cases in the areas of employment, family and/or housing, 2) handle immigration cases and, 3) coordinate and staff a weekly community law program. Candidates should have at minimum 2 years of experience in employment, housing or family. Immigration experience is a plus. Candidates must be comfortable working independently in a fast-paced environment. They must also be prepared to work some non-traditional hours—evenings and the occasional weekend day—and in non-traditional, multiple locations; in exchange, they are afforded great flexibility in work schedule. Preference may be given to applicants who are fluent in Spanish. The starting salary is negotiable—subject to union salary scale and ratification—and will be commensurate with experience, qualifications and salary history. Benefits include medical and dental insurance, travel reimbursement, generous paid time off, coverage of professional fees. 403(b) plan-matching, and potential bonuses. Depending on experience, there may be opportunities for the selected candidate to promotion or upgrade in position. CALA is an equal opportunity workplace and is committed to working closely and effectively with the communities that we serve. Individuals self-identifying as people of color, LGBTQI, socio-economically diverse, persons with a disability, or as otherwise having backgrounds and experiences underrepresented in the legal profession are highly encouraged to apply. To apply, send a cover letter, resume, references, recent writing sample, and salary history to hiring@calachicago.org. We will accept applications until the position is filled. We Are Transforming Legal AId Video! 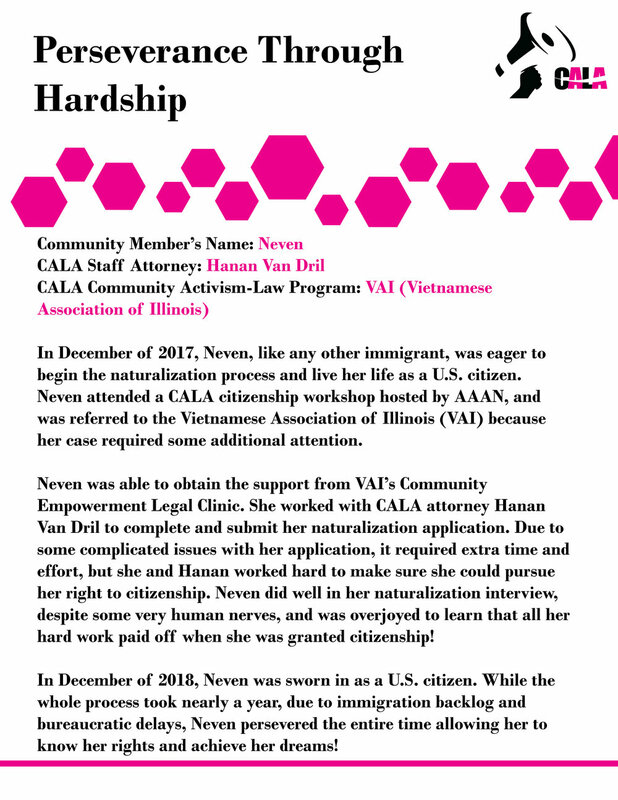 CALA Supports the Integration of New Citizens! What is The FBI Hiding?! 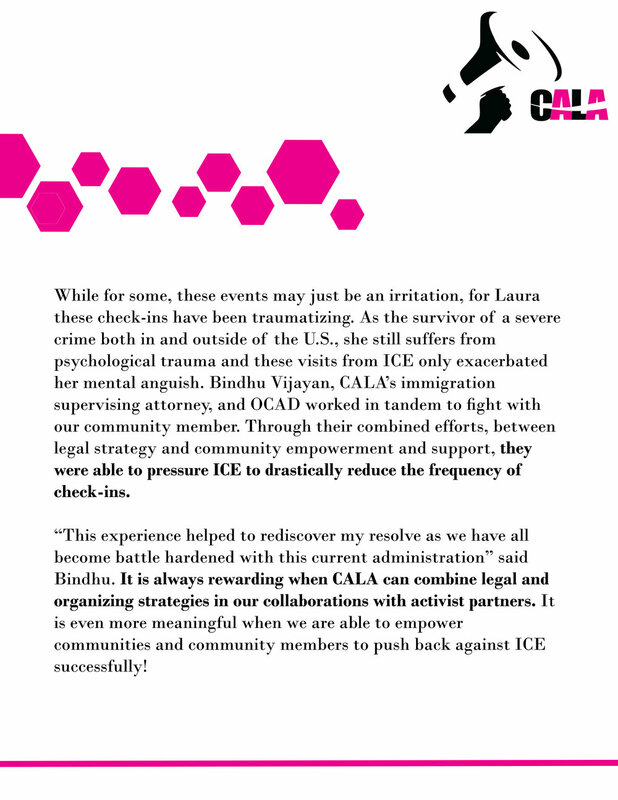 CALA along with the AAAN has filed a lawsuit against the FBI, the Department of Homeland Security and the Department of Justice. Read all about it here! CALA is looking for a staff attorney with genuine interest in community lawyering, connecting the law with grassroots activism, and being part of a new legal services model. CALA uses its model, "community activism lawyering," to unite lawyers and activists to collaboratively help underserved communities access justice and pursue social change. Through these partnerships, CALA creates “community activism-law programs” within and co-operated by communities. CALA accomplishes its two principal objectives at once: provide cost-effective legal services to underserved individual clients and help our activist partners achieve broader social change. Through our work, CALA seeks to change not only how the legal aid system operates but also how lawyers and activists work together. The starting salary range is $50,000-$60,000 based upon experience. Benefits include medical insurance, travel reimbursement, generous paid time off, and coverage of professional fees. 401(k) plan-matching and bonuses may also be available. Candidates must have at minimum 1 year of experience in immigration removal defense. Candidates must be comfortable working independently in a fast-paced environment. They must also be prepared to work some non-traditional hours—evenings and the occasional weekend day—and in non-traditional, multiple locations; in exchange, they are afforded great flexibility in work schedule. Preference may be given to applicants who are fluent in Spanish. CALA is an equal opportunity workplace and is committed to working closely and effectively with the communities that we serve. Individuals self-identifying as people of color, LGBTQI, socio- economically diverse, persons with a disability, or as otherwise having backgrounds and experiences underrepresented in the legal profession are highly encouraged to apply. To apply, send a cover letter, resume, references, recent writing sample for an immigration case, and salary history to hiring@calachicago.org. We will accept applications until the position is filled.